On Friday, March 16, Camden Primary will be transformed into a tropical rainforest. This fascinating comedy animal show will only be at Camden Primary for one show at 6:30 p.m. Tickets are $5.00 per person and will be available at the door. CAMDEN — How can a rainforest come to town? It’s truly something one will have to see to believe. On Friday, March 16, Camden Primary School will be transformed into a tropical rainforest. The show, “Live on Stage, The Rainforest,” performed by Understanding Wildlife, Inc. will make visitors feel like they are right in the middle of the tropical rainforest with the sounds and sights of the Amazon region. Visitors will also see exotic birds, kinkajous, monkeys, and snakes. It all started as a dream for founder and current director Mike Kohlrieser. In the 1980s Kohlrieser and his wife Marcia became increasingly aware of problems in the tropical rainforests. Using his already developed skills as an animal trainer and stage entertainer, Kohlrieser wanted to educate young and old alike about these animals facing possible extinction. In 1992, the non-profit organization Understanding Wildlife, Inc. was created. The goal is simple — educate and inspire individuals to get involved and make this a better world for all (including the animals) to live in. This comedy animal show will only be at Camden Primary on Friday, March 16, for one show at 6:30 p.m. Tickets are $5 per person and will be available at the door. 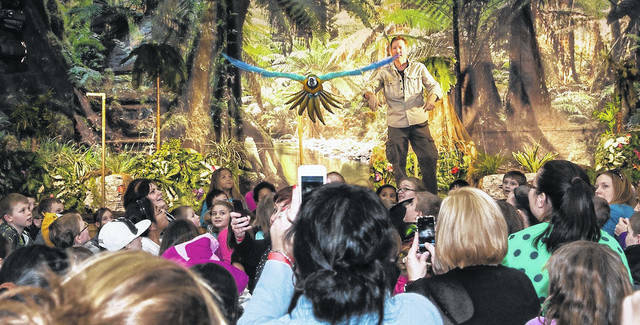 https://www.registerherald.com/wp-content/uploads/sites/41/2018/03/web1_Macaw.jpgOn Friday, March 16, Camden Primary will be transformed into a tropical rainforest. This fascinating comedy animal show will only be at Camden Primary for one show at 6:30 p.m. Tickets are $5.00 per person and will be available at the door.